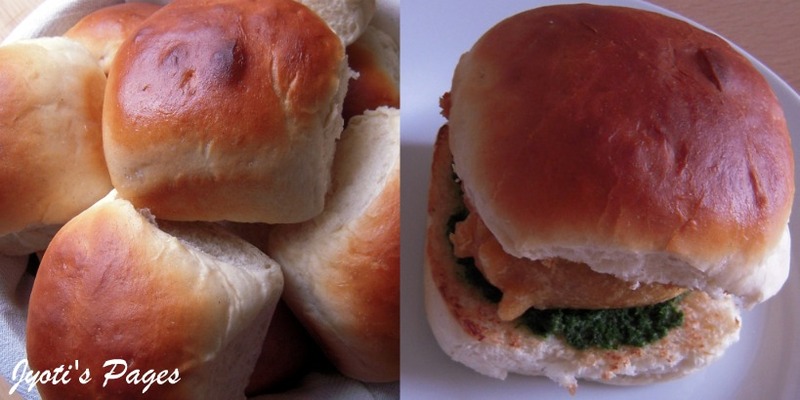 Vada Pav is a popular road side snack from Maharastra, India. It consists of a batata vada (potato fritter) sandwiched between two slices of a pav/ bun smeared with garlic and green chutney (condiments). I had Vada Pav first time while travelling from Bombay to Pune in a road side dhaba and needless to say I loved it. My DH had been asking me to make it at home and finally I did. I had made it on the Ind Vs Pak world cup semi final match. Partly because, I wanted to keep myself occupied or else I would be found pacing up and down in front of the TV(I can't handle the excitement and tension of such cricket clashes). My attempt of making buns at home was a success and I can't help dispalying the pictures. So, this is going to be a long post. I had picked up the recipes from several places and came up with this recipe. Lets have a look. 2 cup extra strong white flour/AP Flour. 11/2 tsp instant dried yeast. 1 1/2 tbsp melted butter. 3/4 cup +2-3 tbsp warm milk. 1 tbsp melted butter for brushing. In a medium bowl add the sugar and hand hot milk. Stir and add the dried yeast. Sprinkle 1 tsp flour over it. Cover it and let it sit for 10 minutes. It will become frothy and ready for use. In a separate large bowl shift the flour and salt and make a well in the centre. Add the butter to the frothy mixture and add it to the flour little by little. Use your hands to bring the flour together to make a dough. Add the extra milk to form a sticky dough. Apply some butter on your palms and bring the dough on a light floured surface. Knead the dough by stretching it at one end and bringing it back till the dough is smooth and springs back when touched. Keep the dough in a clean greased bowl and apply some butter over it to prevent the top of the dough from drying. Cover it with a wet kitchen towel and keep it in a warm place to rise for about 1-2 hours. After the first rise, gently deflate the dough by punching it and knead ofr another 2-3 minutes. Divide it into 9 balls and keep them in a greased tray. Cover it with a wet kitchen towl and keep it in a warm place for the second rising for an hour. After an hour when the dough has risen again, brush milk on the top of the buns and bake it in an oven preheated at 180 C for 12-15 minutes. Brush melted butter when it comes out of the oven. In the pictures above first one is the dough kneaded and ready for the first rise. Second one is the risen dough followed by 9 dough balls ready for the second rising. Last one is the buns out of the oven with butter brushed on top. You can see the texture inside the buns in the picture below. Heat the oil and add the mustard seeds and cumin seeds. When they crackle, add the asafoetida and curry leaves and sauté for a few seconds. Add the ginger garlic mixture, chopped onions and chopped chillies and sauté again for a few seconds. Add the potatoes, turmeric powder, chopped coriander and salt and mix well. Remove from the heat and cool. Divide into 8 equal portions. Shape into rounds. 4. Combine all the ingredients for the outer covering in a bowl and make a batter using approximately 1/3 cup of water. Deep fry in hot oil, till golden brown. Keep them on a kitchen towel so that it absorbs extra oil. Dry roast coconut and tamarind till lightly browned. Grind together with all other ingredients. Do not add water. 2 cup chopped coriander leaves. 1 cup chopped mint leaves. It can be stored for weeks in freezer without adding the lemon juice. I store it in my ice cube tray and use cubes of chutney whenever required. Generally, I microwave two cubes of chutney on medium high for 30 seconds and its ready to use. 1. Cut the bun into two halves. Butter them and toast them on a pan. 2. Smear the chutneys on each side. Place the warm vada on one half and cover it with the other. Ready to serve. Wow, Your pau's looks so nice, professional, I remember i had tried to back a bread loaf once, and that was it, never felt like trying my hand at baking again! But this i am tempted. Will let you know how it turns out to be. This is my favorite snack. Looks so yummy. Superb Di........... u r gr8, planning to open a Bakery or something? 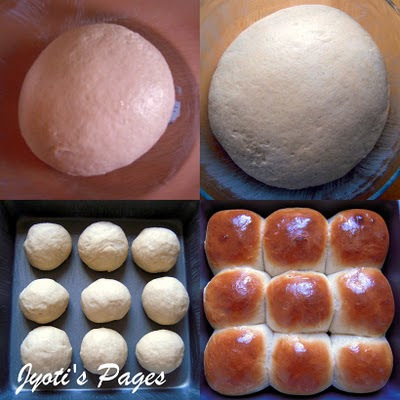 I just loved the pic of puffing Breads, they look gr8. No doubt, how much u would have cherished the view of the dough turning to golden brown Paavs.....they just look awesome, hope i was there with u to binge on them. Ram too is crazy for vada paav. MH Being the neighbouring state of Gujarat , vada paav - to greater extent has become part of gujarati cuisine, so we just hog on them when we r @ surat!!!! This time will definately remember ur paavs while having them. Ram here-- vadaa pav dekhte hi muh mein paani aagayaa.. its looking yummy dear.. jiju must have enjoyed that.. gr8,, gr8 really gr8... keep it up. Your pav looks awesome .. I am so going to bum this recipe from you! Thanks you guys for the beautiful comments.